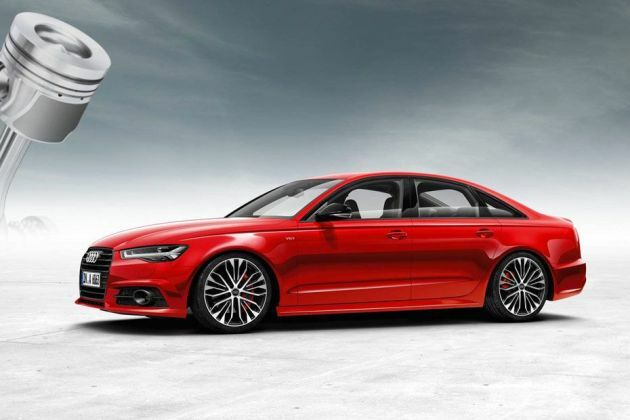 Audi A6 35 TDI Matrix Edition is a diesel variant in this model series that is equipped with a 2.0-litre drive train. This motor is tuned to deliver 187.7bhp power in combination with torque of 400Nm. It is paired with a 7-speed S Tronic automatic transmission gear box. On the outside, this sedan has revamped bumpers and includes Matrix LED headlights at front. The redesigned tail light cluster is integrated with dynamic turn indicators, while the exhaust pipes are also slightly tweaked. Inside the cabin, it gets new leather upholstery for seats and the MMI touch interface is also updated. A navigation system is present along with map updates, which is a plus point. One of its main highlight is the panoramic sunroof that comes with a tinted single glazed safety glass. Other aspects like cup holders, sunvisors, footwell lights and storage spaces are also available. In terms of security, it is loaded with attributes like electronic differential lock, seat belts, ISOFIX child seat mounting points, first aid kit and many more. To describe its front fascia, it has a single-frame radiator grille that comes in a three dimensional design. It includes horizontally positioned slats that are treated with chrome. Surrounding this is a stylish headlight cluster that comes along with Matrix LED headlamps. It also has LED daytime running lights, which further adds to its look. A couple of bright fog lamps are fitted to its well sculpted bumper. Meanwhile, the large tinted windscreen comes integrated with a pair of rain sensing wipers. On the sides, it has an attractive character line that stretches beneath the side windows from headlights to the rear. It has a set of 17 inch alloy wheels that are covered with tubeless tyres of size 225/55 R17. Moving to its rear end, there are trendy LED tail lamps with turn indicators, while the Audi's four rings brings it a stunning appeal. Also, it includes dual exhaust pipes and windscreen with defogger in the rear profile. The cabin is quite spacious and incorporated with well cushioned seats that offer enhanced comfort throughout the drive. There are L shaped headrests that provide good support. Its seats are covered with premium leather upholstery, while there are door trims have artificial leather inserts that further add to the plush quality. It has electrically adjustable front seats with four way lumbar support, while the rear one comes with 60:40 split folding facility. A variety of Audi wood inlays are available as options for the dashboard, center console as well as to its door trims. Some of the advanced equipments on the dashboard include a leather wrapped steering wheel with multiple switches, air vents, instrument cluster and an infotainment system as well. This variant is equipped with a 2.0-litre TDI engine that displaces 1968cc. It comprises of 4-inline cylinders that are integrated with 16 valves. This turbocharged mill has a common rail based direct injection system that enables efficient fuel transfer. It has the ability to produce a peak power of 187.74bhp between 3800rpm to 4200rpm and yields a torque of 400Nm in the range of 1750rpm to 3000rpm. A 7-speed S-Tronic automatic transmission gear box is mated to it, which helps in efficient gear shifting. It can return a maximum mileage of about 17.6 Kmpl on the highways and 13.33 Kmpl within the city. This vehicle can attain a top speed of nearly 232 Kmph besides accelerating from 0 to 100 Kmph in around 8.4 seconds. Both its front as well as rear wheels are fitted with ventilated discs brakes that enable proficient braking and control. It is also accompanied by ABS with EBD and brake assist. It is incorporated with an adaptive air suspension system that electronically regulates the height and damping. This comes along with an infinitely variable damping system, including manual lift function and lever control as well. Also, it is offered with a rack and pinion based electromechanical power assisted steering column with speed dependent control. In terms of comfort, it has an Audi music interface through which portable players like iPods, and iPhones can be connected. It has an Audi sound system with Bluetooth connectivity. It comes with MMI navigation plus and has 20GB music storage space. There are two 12V sockets in the rear cabin, which are useful for charging electronic devices. A driver information system is available with a 12.7cm TFI monochrome display. It has electrical sun blinds for rear windscreen, while there is also a tilt and slide electric sunroof. Other aspects like sunvisors with illuminated vanity mirrors, remote boot lid opener, four zone deluxe automatic air conditioner, and engine start/stop button are also on this list. It is bestowed with eight airbags along with integral head restraint system. It comes with Audi pre-sense basic technology, which initiates all protection measures if needed, including belt tensioning, activating the hazard warning system and closing the windows. Beside this, there is a visual and acoustic parking system with its display on the MMI screen. Also, it includes night vision assistant system, electronic stabilization program, electronic immobilizer, and various other protective features. 1. Sophisticated brake energy recuperation system. 2. Availability of numerous comfort aspects. 1. Rear cabin room needs an improvement. 2. Maintenance costs are quite high. ఆడి ఏ6 5 వేర్వేరు రంగులలో అందుబాటులో ఉంది - Tornado Gray, Moonlight Blue Metallic, Matador Red, Mythos Black, Ibis White.